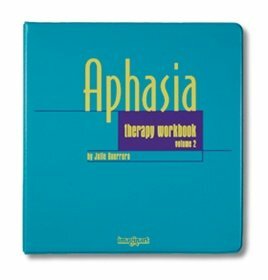 AliMed Aphasia Therapy Workbook, Vol. 2 by AliMed at Bijc. MPN: 81903. Hurry! Limited time offer. Offer valid only while supplies last. Aphasia Therapy Workbooks, Julie Guerrero Exercises and activities that clients like and that prove more beneficial in therapy and home programs. Aphasia Therapy Workbooks, Julie Guerrero Exercises and activities that clients like and that prove more beneficial in therapy and home programs. Great for face-to-face therapy. When material is used for between-session practice, clients recover their language skills more quickly. The two workbooks are reproducible. They feature: word retrieval, graphic skills, problem solving, and reading skills, independent completion, activities presented at different levels for graded practice, large, easy-to-read type, and uncluttered pages.Volume 2 emphasizes spelling skills as well as more word finding, cognitive skills and problem-solving activities. It also includes crossword-style fill-ins, word searches, letter subtraction, finding words within words, and more. 372 pages, three-ring binder. Volume 2emphasizes spelling skills as well as more word finding, cognitive skills and problem-solving activities. includes crossword-style fill-ins, word searches, letter subtraction, finding words within words, and more.